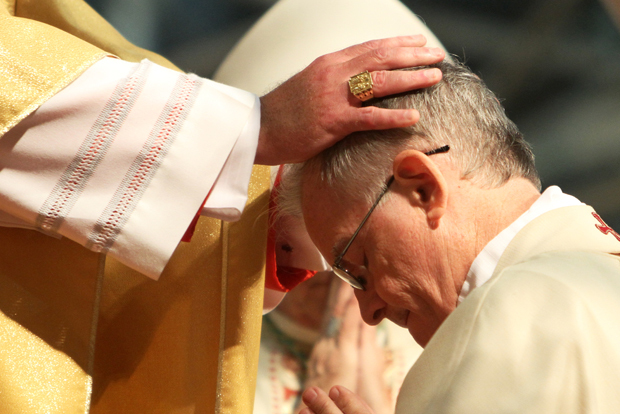 VATICAN CITY (CNS) — Although the number is not high, it is no longer “exceptional” to have priests turn down an appointment as bishop, said Canadian Cardinal Marc Ouellet, prefect of the Congregation for Bishops. Speaking Feb. 1 about the annual course his office sponsors for new bishops, the cardinal was asked about rumors that more and more priests are saying they do not want to be a bishop and declining an appointment even when the pope, on the recommendation of Cardinal Ouellet’s office, has chosen them. “But the capacity to relate to people, to establish dialogue, to start from the point where people are — this is a quality that is also requested,” the cardinal said. Pope Francis’ “charism is to be very compassionate, very close to people, but at the same time, he knows where he leads people: to our Lord Jesus Christ,” he said. The speeches, homilies and reflections from the September 2015 course were published recently in a book, “Witnesses of the Risen One.” Cardinal Ouellet said he hoped publishing the papers would help bishops in their ministry as well as elicit suggestions for improving the course. More than 1,500 bishops have participated in the past 14 years, he said. While it includes sessions on finances, rapport with one’s priests and on preventing clerical sexual abuse, most participants say the most valuable part of the course was the opportunity to meet, discuss and pray with bishops from around the world. “Every pope has his gifts and this influences the way younger bishops act,” Cardinal Ouellet said. “One identifies with the style” of the pope who nominated him and often tries to make choices he thinks the pope would make in ministry, lifestyle and — especially with Pope Francis — in ways of communicating; “he breaches boundaries in proclaiming the Gospel,” the cardinal said.